This weekend is Easter holiday in the <?xml:namespace prefix = st1 ns = "urn:schemas-microsoft-com:office:smarttags" />UK along with many other Christian countries around the world. Easter is an important annual festival for Christians to celebrate Christ’s resurrection from his death three days after his crucifixion. 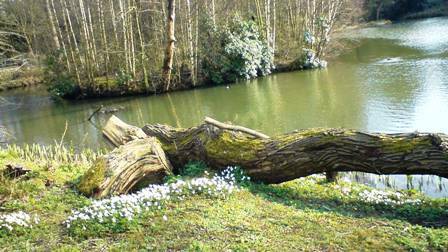 In the UK, it is, however, eagerly anticipated by not only Christians, but also non Christians alike as a part of tradition and a signal for the beginning of spring. 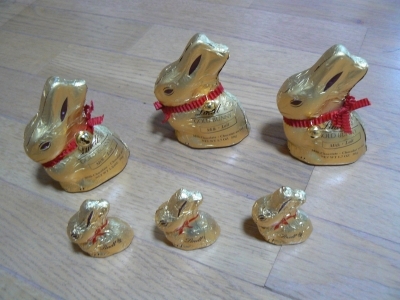 The tradition of exchanging and eating the Easter eggs and bunnies both made of chocolate is especially popular there. Soon after New Year, you would notice chocolate Easter eggs start appearing in supermarkets’ shelves. 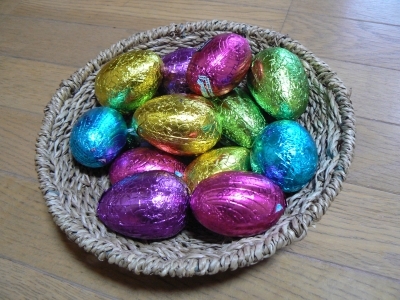 Towards the actual holiday, you would find the eggs and bunnies wrapped in colourful foils and beautifully decorated at shops everywhere and the sale of chocolates shoots up, well, just like St Valentine’s Day in Japan. But don’t you wonder why eggs and bunnies? Well, eggs are a symbol of spring and new life after all. The Easter eggs are a very old tradition started well before Christianity. Before they were replaced by chocolate Easter eggs, real eggs were used, usually chicken eggs. They were hard-boiled and dyed in bright colours that represent spring and light. Rabbits, due to their fecund nature, have always been a symbol of fertility. The Easter bunny (rabbit), however, may actually be an Easter hare. According to an Anglo-Saxon legend, the Saxon goddess Eostre found a wounded bird and transformed it into a hare, so that it could survive the winter. The hare found it could lay eggs, so it decorated these each spring and left them as offering to the goddess. In the UK, children believe that if they are good, the Easter bunny will leave (chocolate) eggs for them. These eggs are said to be hidden about the home or garden by the Easter bunny. By the way, Easter occurs at a different time each year – Easter Day falls on the first Sunday after the full moon day on or after the vernal equinox. This year, Easter Day is today, 12th April and the holiday and celebration actually started from Good Friday which was 10th April and ends on 13th April, Easter Monday. I’ve just had a fantastic week in <?xml:namespace prefix = st1 ns = "urn:schemas-microsoft-com:office:smarttags" />London catching up with friends and family. How much I missed the hustle and bustle of London streets teaming with cafes, shops and street markets. How much I missed the serenity and quietness of parks and open spaces dotted around the city like an oasis in the desert. AND the sun, indeed, shined all through my stay there! The beautiful spring like days continued from day one. 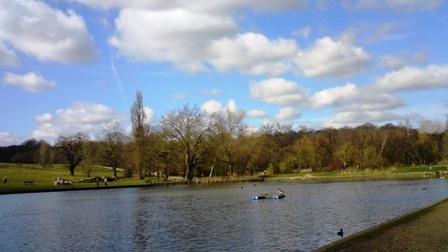 One of my most favourite places in London is Hampstead Heath. 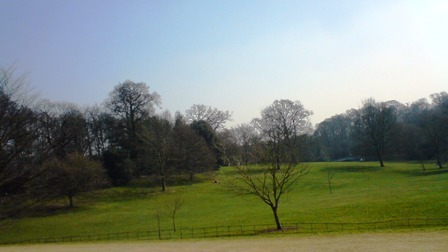 The heath is located in northwest London and it is a large open space. 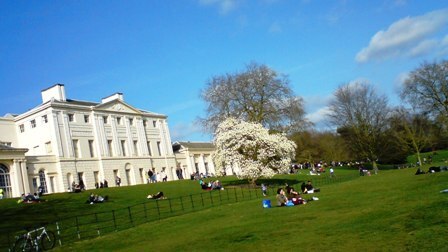 In its north end, the historical Kenwood House sits in its all glory. A magnificent estate that used to be a private residence of the aristocracy. 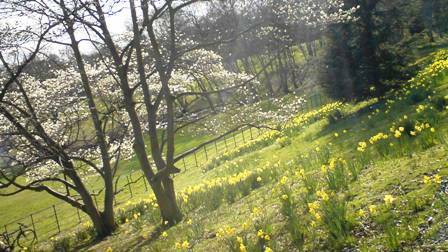 Nowadays the estate is owned and managed by The National Trust. During summer months, numerous classical concerts and operas are held in its open stage built across from an ornamental pond. The audiences normally bring a hamper with a bottle of wine or two, and enjoy a picnic on the sloping grassy area from the estate to the pond while listening to the concert. 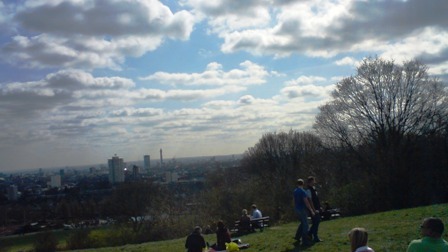 In its south end, you will find Parliament Hill which is famous for kite flying and spectacular views of London. From the top of the hill, you can clearly see Canary Wharf in the Docklands, St Paul’s in The City and The British Telecom Tower in the West End among many other famous landmarks. Personally, it is not my cup of tea to swim in the pond, but my dogs have enjoyed a swim or two, not in the bathing ponds, of course. Anyway, I just love Hampstead Heath – walking, picnicking, or just sitting down on the one of many benches looking on the passersby – both humans and dogs. Nothing more relaxing than that! Next Tuesday, 24th February, is Shrove Tuesday or better known as “Pancake Day” in the <?xml:namespace prefix = st1 ns = "urn:schemas-microsoft-com:office:smarttags" />UK. If you are not a Christian, you, no doubt, will wonder what this day is about. Shrove Tuesday is the last day before the period which Christians call “Lent” begins. It is known as Pancake Day as pancakes are eaten on this day traditionally. And your next question will be why pancakes are eaten on this particular day, right? Well, to explain this you need to know about Lent first. Lent is the period of forty days (not counting Sundays) leading up to Easter Sunday, and during this time, Christians replicate Christ’s sacrifice and deprivation in the wilderness by fasting, both from food and festivities. So Shrove Tuesday is the last chance to indulge yourself, and to use up the foods that aren’t allowed in Lent. Hence, pancakes are eaten on this day as they contain butter and, particularly, eggs which were traditionally forbidden during Lent. Nowadays only a small number of people actually fast for Lent, and it is more common for believers to surrender a particular vice such as a favourite food. The tradition of eating pancakes remains, however. So what does an English pancake look like? A pancake is a thin and flat cake, made of flour, eggs, milk and butter. It is cooked in a frying pan and looks very similar to French crepe. They are both delicious, though. 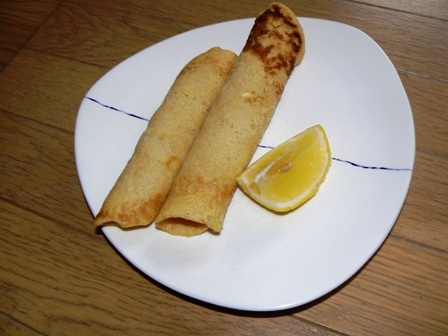 Anyhow, an English pancake is traditionally served with a sprinkle of caster sugar (superfine sugar) and a dash of fresh lemon juice over the top. It is very simple to prepare, so why don’t you try the recipe below and enjoy the British tradition? Christmas and the New Year’s celebrations have become a distant memory. The next big event (? ), I guess, will be St Valentine’s Day which is coming up this Saturday. St Valentine’s Day is traditionally a day to celebrate love. In Europe and the <?xml:namespace prefix = st1 ns = "urn:schemas-microsoft-com:office:smarttags" />US, it is a day for those who are in relationships to exchange cards and gifts as a token of their love to each other. I don’t know about other countries, but in England, the popular St Valentine’s Day gifts from men to women are a bouquet of flowers - mainly buds of red roses, a box of chocolates and lingerie and so on - well, something romantic. I remember that every St Valentine’s Day, the ladies loo at an investment bank I used to work for turned into something similar to a florist, as partners of female employees sent bouquets of flowers to their loved ones. The gifts from women to men are more varied, however. In my case, I always send a box of chocolates to my husband who is a chocoholic of the first degree. I know he will appreciate it. Whereas in Japan, St Valentine’s Day’s real meaning has been somewhat twisted and it has become a day for females to send chocolates to their male counterparts. I suspect this weird custom was started by confectioners to sell chocolates many years ago. Their strategies, without any doubt, have been a resounding success! Japanese females are not only encouraged to send chocolates to their real targeted recipient, but also to any male associates including male family members, friends, acquaintances and colleagues. 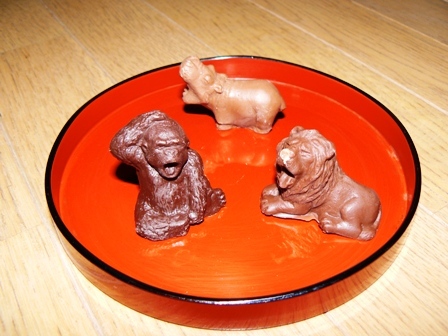 These, sort of obliged gifts are called “giri choco” in Japanese and it literally means obliged chocolates. How many million of yens are spent in giri choco each year, I wonder…? The other day, I visited a so-called chocolate exhibition organised by one of the large department stores in Osaka. It was absolutely packed with heaving female bodies. There were so many chocolatiers vying for our attentions with beautiful and mouthwatering creations of chocolates. 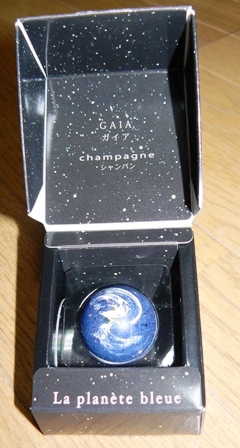 Some of the chocolates on offer were quite outlandish and they had an outlandish price to match. I couldn’t believe that the average price for one chocolate sold there was about 500 yen (roughly 3 quid)! Was it only me who thought it outrageous? Anyhow, personally I think this silly custom of sending giri choco should be scrapped! I’ve heard that sometimes one person receives an excess amount of giri choco - more than he can consume even if he is a chocoholic. Many guys are, however, not so fond of chocolate generally and it is a fact. So what will happen to these unwanted chocolates? Well, sometimes they will be thrown away. There are so many people in the world starving and here in Japan, this outrageous excess is allowed. Don’t you think it is much better to send a well-thought gift as a token of love, gratitude or whatever reasons you may choose? I can’t help thinking that the sending of giri choco for the sake of sending chocolate as is the custom will lose the true meaning of “giving”. Hope more of my sisters will think this way. Oh, by the way, guys in Japan, why don’t you send a bouquet of flowers to your loved one on this St Valentine’s Day? I guess you have heard of “Afternoon Tea” before. Some venues offer its original menu such as “Chocolate Afternoon Tea” at the Ritz, however traditionally Afternoon Tea consists of various finger sandwiches such as the mandatory cucumber, and smoked salmon sandwich. It also includes a variety of pastries, biscuits and cakes. A wide selection of teas are normally offered and from which you can choose your favourite. AND most importantly (?) it is always served with scones! In my opinion, nothing tastes better than still warm scones heaped with Devonshire clotted cream and strawberry preserve. Surrounded by the gorgeous décor of super luxurious hotel, partaking Afternoon Tea while listening to live piano music or string quartet is a wonderful experience. A venue like that normally has a strict dress code that requires a jacket and tie for gents and no jeans are permitted. The drawbacks for this beautiful ritual, however, are you need to make a reservation 6 weeks in advance at some venues and it is not cheap! The traditional Afternoon Tea will cost you about £35 onwards that is roughly 7,000 yen per person! It is beyond the means of ordinary folks and, unless you are super rich, you can only indulge in the experience for special occasions such as birthdays and anniversaries. Having said that normally loads of food, sometimes more than you can consume, is served with tea. So you can have Afternoon Tea instead of lunch or supper, then it might not sound that expensive. If you think Afternoon Tea sounds too posh for your liking, how about “Cream Tea” instead? 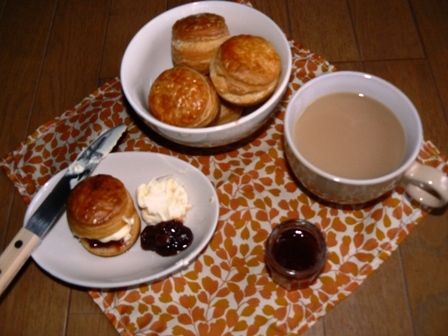 Cream Tea comes with tea and scones, clotted cream and strawberry preserve. Clotted cream is a must! It is traditionally made in Devonshire and tastes like something between butter and cream. It is quite rich, but utterly delicious! If you travel to Southwest of England, counties like Dorset, Devon and Cornwall, you will notice the sign for “Cream Tea” everywhere. Homemade scones served at simple local cafes in theses areas are out of this world! There is a small village called Lulworth in Dorset which is famous for its cove, beautiful horseshoe shaped harbour. I just loved scones served at a small café by the Cove and every time we visited the area, we always treated ourselves with Cream Tea there. Speculating how fattening scones heaped with clotted cream and a huge drop of strawberry preserve are (each contains possibly 800 calories!? ), I still gobbled down at least two, sometimes more! Drat! I have developed a serious craving for scones now. Got to find clotted cream first, though!